In part I and part II of this post, we created a suite of unit and integration tests for a simple S3 wrapper Java class. Unit tests focused on testing the class in isolation by using mock objects instead of real Amazon S3 objects and resources. In addition, integration tests were created to complement unit tests and provide an additional layer of verification that uses real objects and resources like S3 buckets, objects, and versions. In this last post in the series (part III), we’ll show how the unit and integration security tests can be incorporated into a CI/CD pipeline to automatically verify the security behavior of code being pushed through the pipeline. Follow the steps in the Integrating AWS CodeCommit with Jenkins blog post to install Git and create an AWS CodeCommit repo. Download the source code and push it to the AWS CodeCommit repo you created. 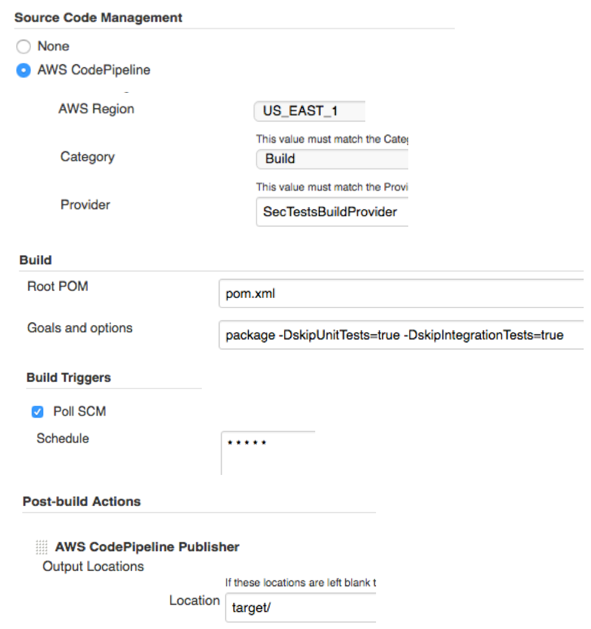 Follow the steps in the Building Continuous Deployment on AWS with AWS CodePipeline, Jenkins and AWS Elastic Beanstalk blog post to install and configure Jenkins on Amazon EC2. Make sure you install the AWS CodePipeline Jenkins plugin to enable AWS CodePipeline and Jenkins integration. In addition, create three Jenkins Maven jobs following the steps described in section “Create a Jenkins Build Job” in that blog post. However, for the Job parameters described below use the values indicated in the table instead. Make sure you pick an AWS region where AWS CodePipeline is available. 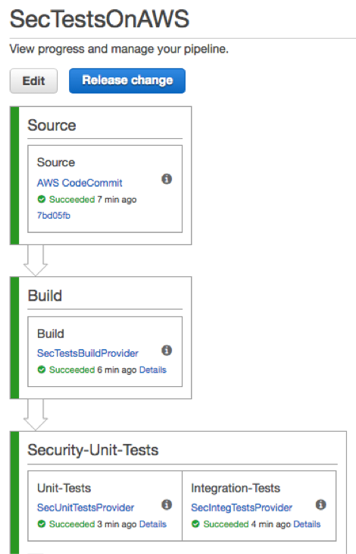 In the AWS CodePipeline console, create a pipeline with three stages, as shown here. Choose AWS CodeCommit as your source provider and enter your repo and branch names where indicated. We are not adding a pipeline stage/action for application deployment because we have built a software component (S3ArtifactManager), not a full-fledged application. However, we encourage the reader to create a simple web or standalone application that uses the S3ArtifactManager class and then add a deployment action to the pipeline targeting an AWS Elastic Beanstalk environment, as described in this blog post. After the pipeline has been created, choose the Release Change button and watch the pipeline build the S3ArtifactManager component. If you are looking for a more hands-on experience in writing security tests, we suggest that you extend the S3ArtifactManager API to allow clients to retrieve versioned objects from an S3 bucket (for example, getObject(String bucketName, String key, String versionId)) and write security tests for the new API. In this last post of the series, we showed how to automate the building and testing of our S3ArtifactManager component by creating a pipeline using AWS CodePipeline, AWS CodeCommit, and Jenkins. As a result, any code changes pushed to the repo are now automatically verified by the pipeline and rejected if security tests fail. We hope you found this series helpful. Feel free to leave your feedback in the comments.